As we have for years, Premier Arms is always on the lookout for new and better products to offer our customers. After months of independent testing and thousands of rounds down range we are sold on the best lubricant we have ever tested. 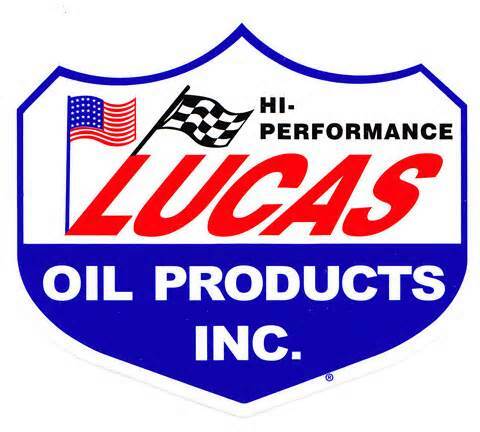 Lucas Oil has been a leader in the lubrication market. Building on their long line of high quality lubricants and additives, Lucas Oil has introduced Lucas Extreme Duty Gun Oil to its sporting oil line. Below you can read more about all the products in the sporting oil line, especially the new Lucas Extreme Duty Gun Oil. 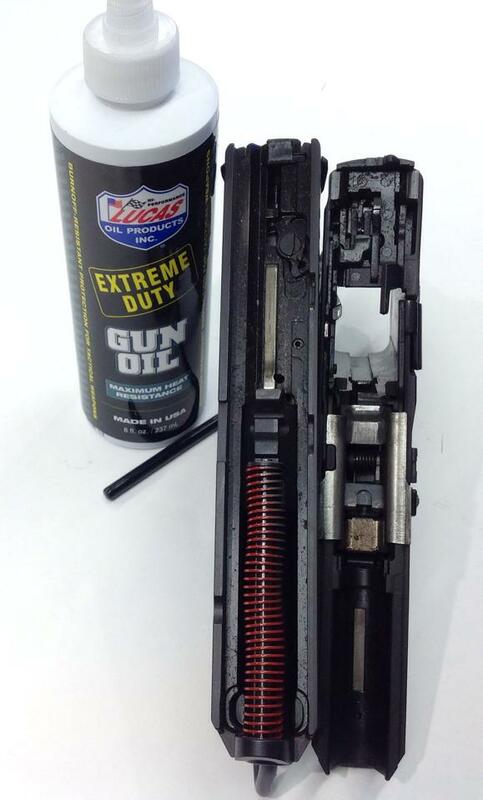 Being a Class 3 dealer, and dealing with full-auto and suppressed firearms, we were very excited when Lucas Oil announced that they had formulated their Extreme Duty Gun Oil specifically to lubricate and protect full-auto and high volume firearms as well as suppressors. We got some of the oil and started testing it (see sidebar) and quite frankly we were amazed. In short, Lucas Extreme Duty Gun Oil kicks all other oils butts, period, hands down. Lucas Extreme Duty Gun Oil is specially formulated for high volume, high heat and friction firearms. Designed for semi-auto rifles, shotguns and pistols as well as full auto and suppressed firearms. It offers superior burn-off resistance, unlike any other multi-purpose oil. Polymeric film protects from rust, wear and moisture. It neutralizes acids from fingerprints and resists drying for long term storage use. 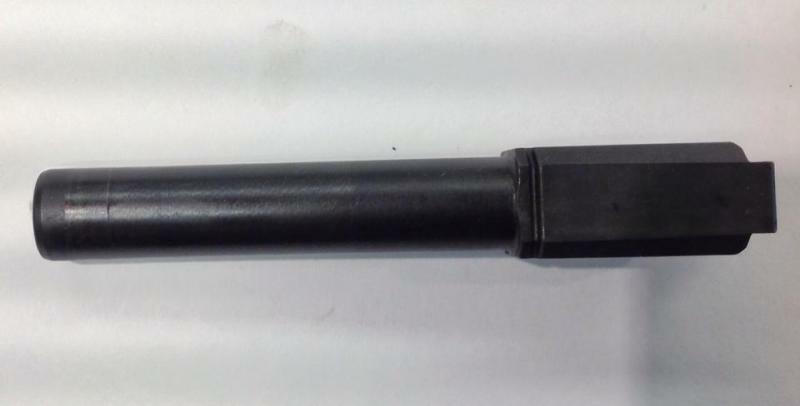 Its protective film makes firearms and suppressors easier to clean. It comes in a generous 8 ounce bottle for the high volume and high use shooter. Lucas Gun Oil is an all-weather, odorless lubricant that has a lower viscosity then the Extreme Duty Gun Oil. Great for general lubrication on all sporting arms such as pump, over/under and side by side shotguns, bolt and lever action rifles and revolvers. Polymeric film protects from rust, wear and moisture. It neutralizes acids from fingerprints and resists drying for long term storage use. It comes in a smaller 2 ounce bottle, great for the range bag or cleaning kit. 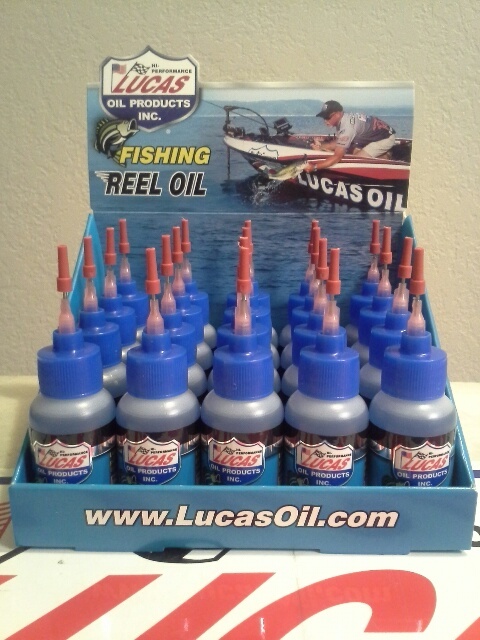 Lucas Fishing Reel Oil is a special blend of oil and additives specifically designed to lubricate all moving parts in fresh water and salt water fishing reels. It penetrates into tight spaces to lubricate small high speed bearings and between tight surfaces. It provides rust corrosion protection even under the most adverse conditions. Also works great on folding knives. It comes packaged in a 1 ounce bottle with a precision needle applicator for one-drop applications allowing you to put just the right amount of lubricant into hard to reach areas. For this test we wanted to subject Lucas Extreme Duty Gun Oil to harsh, real world conditions to determine how it held up. We started with a brand new H&K VP9 that had only been test fired at the factory. The VP9 was field stripped, thoroughly cleaned and all factory applied lubrication was removed. The VP9 was then lubricated using Lucas Extreme Duty Gun Oil per factory specifications. The VP9 was taken out and 2000 rounds of various factory 9mm ammunition was fired through it. 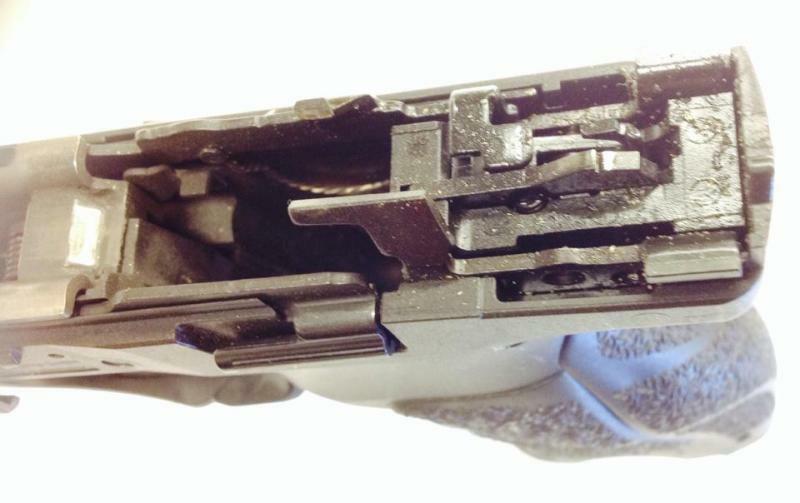 The VP9 was not cleaned or re-lubricated during the firing of the 2000 rounds. There were zero malfunctions. The VP9 was field stripped and photographed. You can see from the photos that the lubrication film is still very much intact and best of all there is almost no signs of wear. Most tests conclude after 2000 rounds, but not ours. Our goal, run the VP9 until it fails, with just the original application of Lucas Extreme Duty Gun Oil providing lubrication and preventing wear. No cleaning, no re-lubrication, just round after round of 9mm until something gives. We will keep you updated. Slide bottom after 2000 rounds. Frame rails after 2000 rounds. 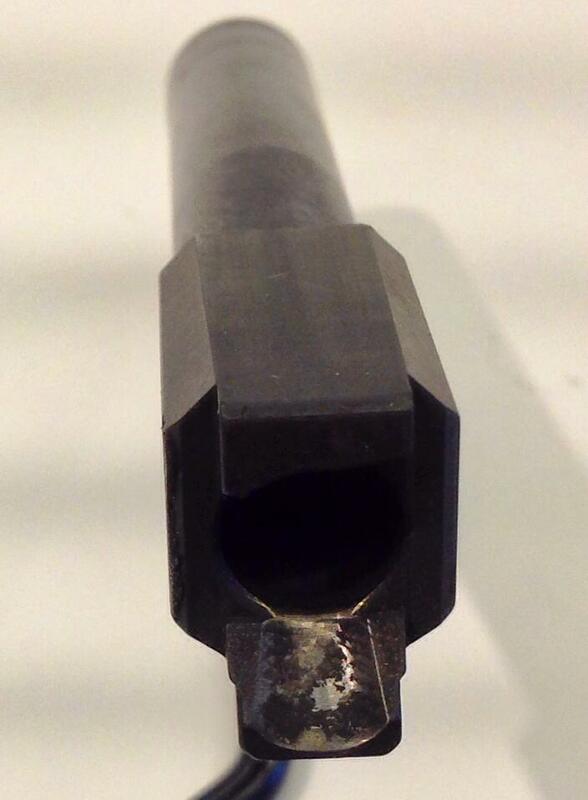 Barrel after 2000 rounds, notice the lube film and no signs of wear.